Household tip: Save Space with Rectangular Containers! I read an article recently about how Costco was keeping its prices down despite rising fuel costs by asking manufacturers to switch to rectangular containers from round. That way they were able to fit more product per palette and thereby more product in each truck. Such a simple change to make a big difference is ingenious. Along a similar vein, Dave and I have always resisted accumulating more stuff that would then require us to to buy a larger home. Out here in Silicon Valley, going up to a much larger place is not only a bad financial decision, but nearly impossible for us. We’re always trying to find ways to be efficient with our space, but without spending a lot of money on handy organizational products or worse, personal organizers to come to our house and tell us how to buy and arrange such products. Tonight I was pouring Dante’s kitty food into reused containers where I store the food until he’s ready for it and I realized a trickle-down effect of Costco’s change. 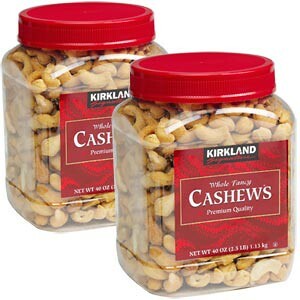 Since they now sell square plastic cashew and peanut containers I am able to fit more in my closet after filling them from Dante’s gigantic bag of food. Now I can’t wait for other manufacturers to catch on so I can buy yogurt, cottage cheese, and Smart Balance in boxy containers. We did cave in and buy some Snapware from Costco so we do have BPA-free non-round containers for our food too, but it would be nice to be able to continue reusing food containers simply to be less wasteful. Do you have any organizational tips that are simple, but also so brilliant they must be shared? Cats are easier to store when they are boxy too. You guys are sick! You should be arrested for cruelty to animals! I hope someone tries to shove you into a box and….oh, it’s a joke. Ok, I get it. LOL.